Recently my girlfriend and I attended a game night, with eight other couples. The purpose of this event was geared toward building larger networks of friends within the Philadelphia area. As the night began we decided it would be only appropriate to go around the room and introduce ourselves and give a brief description about what we currently do, our educational backgrounds and our reasoning for joining the group. As everyone went around the room sharing their stories, there were a few commonalities. (1) Half of us attended and/or worked at HBCUs and the other half attended and/or worked at PWIs. (2) Slightly over half of the attendees were affiliated with historically Black Fraternities and Sororities. (3) The grand majority of us had been in the Philadelphia area for less than five years. But the one commonality that we all shared was that we were all under 30 years of age and highly educated. As the night progressed, we spoke about everything from the state of HBCUs and the educational attainment of Black people to real estate and building Black wealth. In fact, the conversations and camaraderie were so vibrant and delightful; I realized this was the first time in over three months since homecoming at North Carolina Central University (NCCU) that I felt this free. Although I currently attend/work in a space that some consider an educational marvel, I often feel forced to subdue my #BlackBoyJoy. In this space, I often find myself questioning my intelligence and suppressing my Blackness. Questions such as, “be cautious of how you speak” or “think about how you present yourself,” often raddle throughout my mind. As a result, I have found myself at times taking a back seat to conversations in which ignorance and stupidity are spread about people of color within this space. But more specifically, Black people and those who attend(ed) HBCUs. But, at this liberating event, I reconnected with the true ideology of what makes Black people so magnificent. As I listened to my new friends speak, I remembered the beautiful conversations we had back at NCCU about Black liberation. I recalled, the times I would travel to Howard University (HU) or North Carolina Agricultural and Technical University (NCAT) and witness oceans of Black bodies learning and engaging about how to transform our nation. I remembered reading literature on Booker T. Washington and learning about how he escaped slavery and founded Tuskegee University. I recollected attending the 2015 HBCU All-Stars conference and witnessing Black students representing their institutions proudly and unapologetically. But most of all, I remembered a younger me leaving NCCU to take on the University of Pennsylvania. Currently, I assist a close colleague of mine with running a program called Black Men United (BMU) on my campus. I often witness these young men sadden by the lack of Black representation among faculty, administrators and fellow students here at the institution. In fact, when these conversations come up, I often think to myself, “Wow, I never realized how lucky I was as an undergraduate student at an HBCU.” I recall taking advantage of engaging with Black professors or Black administrators. But most of all, being able to walk out of my dorm and see hundreds of Black men and women all striving for their educational attainment. Later on, that night, as the event came to an end, I thought to myself, “In this room we have, doctors, engineers, educators and future trailblazers.” My fellow comrades represented the epitome of Black excellence. In their aspirations and dreams, I saw the reasoning behind the creation of HBCU. I witnessed the dreams that Martin, Mary McLeod, Toni, Alice and so many other African-American trailblazers fought for. In fact, through their aspiration, I understood the importance of Andrew Gillum and Stacey Abrams, both HBCU alums who sought the highest governmental seats in their respective states. Black excellence is more than a catchy hashtag or words written across the front of a hooded sweatshirt. Black excellence is, in fact, our ancestor’s wildest dreams. It is what we as people of African descent strive for each and every day. It is the lifeblood of what keeps us going when it seems our humanity is being questioned. Black excellence is me and every other Black person working towards the advancement of our people. Attending this event ensured me that my voice matters, that my intellect is wanted, that my sacrifices are worth it. But most of all, it reminded me that in order for the next generation to have a path to follow, we must continuously work towards the dreams and aspirations we have been told we can not accomplish. 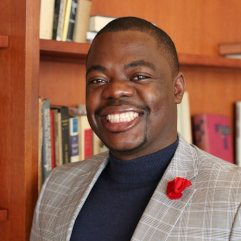 Ndeh “Will” Anyu is a doctoral student at the University of Pennsylvania and the assistant director for Operations and Programs at Penn Center for Minority Serving Institutions.